Put any fruit, flower, herb, shrub, or tree cutting in a Power Cloner™ and be amazed with the prolific roots initiated in only a 5 to 10 day period. Power Cloners™ root cuttings with the aeroponics method which is one of the simplest and fastest ways to initiate roots. 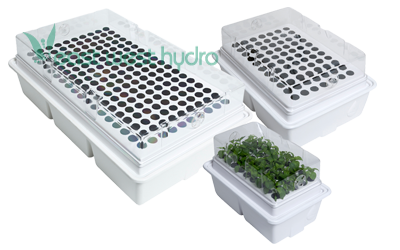 They are highly efficient and spray plant cuttings utilizing a high output pump and microjets to deliver a highly oxygenated rooting solution. High-pressure submersible pump included with 2 year warranty. Dimensions: 25in. × 15in. × 3in.